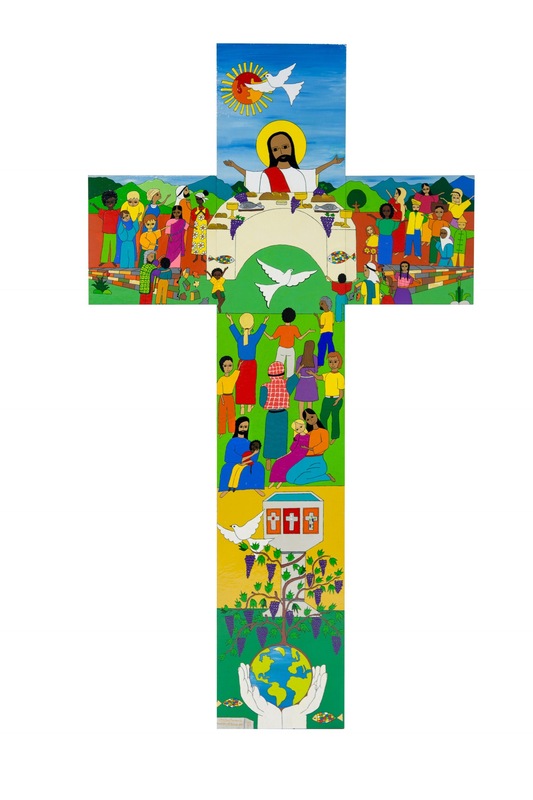 Salvadoran artist Christian Chavarria has created a vibrant 2m-high cross for the joint Reformation commemoration, replete with meaning for both Catholics and Lutherans. Dirk Lange says the significance of the design lies in its depiction of God’s creative and sanctifying work. Here, he explains the detail of the cross design, drawing on the document From Conflict to Communion. All actions and symbols in this image point to Christ – his life, death and resurrection. The arms of the faithful are raised in thanksgiving for what God is doing. When Lutherans and Catholics meet to commemorate the Reformation anniversary, they will do so under a cross that carries a message of hope from one of the world’s most violent countries. Salvadorian artist Christian Chavarria Ayala has painted perhaps the most significant piece in his careers to date – the cross for the common prayer service of the joint ecumenical commemoration 31 October in Lund and Malmö, Sweden.